The explosion of a V2 rocket caused considerable damage within a 180-metre radius. One out of twelve rocket launches failed. The others fell into the sea or pulverized in the atmosphere. V2 rockets fell on at least twelve different places, partly on the built-up area of The Hague. The explosive load of 1000 kilogram caused a lot of damage on the impact. The fuel of the rocket falling back to earth caused even more damage. Because a falling rocket did not penetrate the ground as deeply as it would normally do at the end of its ballistic trajectory, the overall destruction of the area was greater. Occasionally, the war head of a falling rocket, or the one of a rocket exploding in mid-air, remained intact. The aftermath of the unsuccessful rocket launches caused the death of 60 inhabitants as well as 126 wounded. A large number of houses were destroyed or damaged in such a way that they became uninhabitable and had to be demolished. The windows of more than 6000 houses were shattered. At first this looked like minor damage, but as there was very little glass available, many houses had to be boarded up. During the severe winter of 1944, when food was very scarce and also limited supplies of fuel and energy caused great inconvenience.This meant a huge inconvenience to the stricken inhabitants. 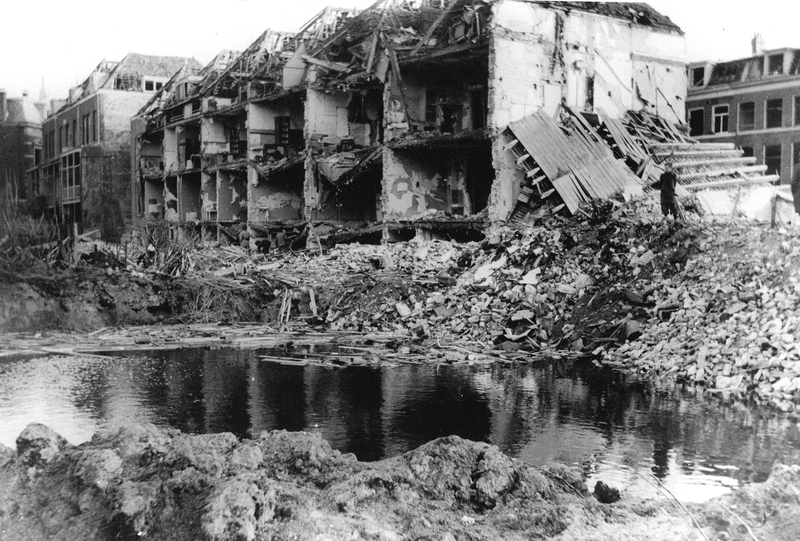 Destruction in the Riouwstraat after a V2 crash on 25 January 1945.
heirloom. In the rubble of the Riouwstraat survivors left messages on door posts and suchlike to inform their worried relations that they were alive and to leave their new address. This was also practiced at other bombed out houses. The destruction at the Riouwstraat was surpassed by the one at the corner of the Indigostraat and the Kamperfoeliestraat. On January 1st, 1945 at 5.15 hrs a V2 rocket fell after an unsuccessful launch. Twenty four people died and 50 were wounded. Relatively few victims fell due to the fact that at this time many people were with family, friends and acquaintances celebrating the New Year. Seventy six houses were destroyed or severely damaged, and in a radius of two kilometres the windows of 2844 houses were shattered. Shortly after the war, the firm of Keuzekamp had a Memorial Plaque placed to commemorate the V2 disaster on January 1st, 1945. Some time later they moved the plaque to the Indigostraat. The Willem de Zwijgerlaan was hit twice by a crashing V2 rocket. Presumably the first rocket fell presumably about the 31st of December, 1944 near the Jacob Hopstraat. About February 8th 1945 the second rocket probably crashed between the Antonie Duyckstraat and the Van den Eyndestraat. As the Willem de Zwijgerlaan was in an out of bounds area (Sperrgebiet), there were no Dutch civilian victims. On March 12th, 1945 Duindorp was hit by the wreckage of a V2 rocket exploding in mid-air. Debris hit the Flakkeesestraat and a large number of houses were destroyed by the explosion and the fire which followed. Because it was an out of bounds area (Sperrgebiet), there were no Dutch civilian victims. On March 23rd, 1945 at 9.10 hrs a cluster of three houses near the police station in the Duinstraat were hit by fragments of a V2 launched from the Statenkwartier. It exploded in mid-air after it 'went berserk'. One of the buildings hit was that of removal and coal firm 'Spaans' on the Westduinweg. Six people died, four of them members of the Van der Ende family, seeking cover in an air-raid shelter near tramline 11. Only hours later the Wehrmacht allowed access to the impact area so that the survivors could remove the dead bodies from the rubble. 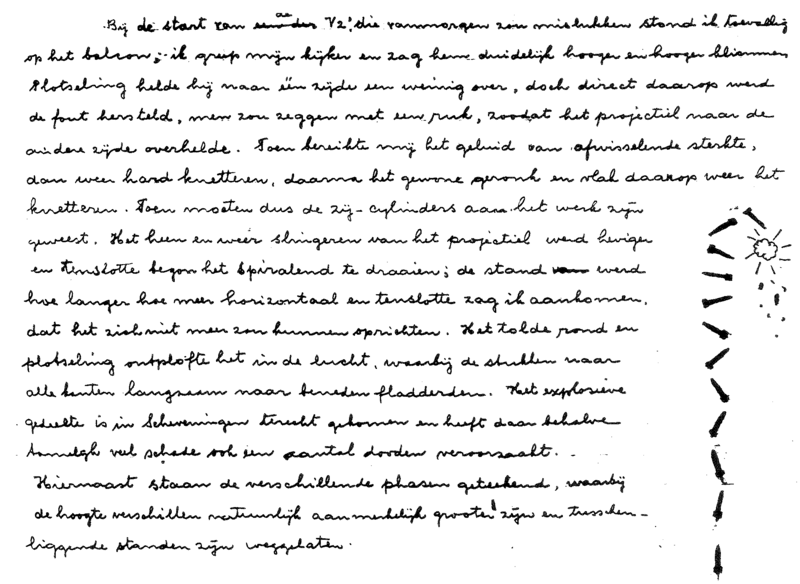 Diary fragment of S.C. van Vleuten about the V2 crash on March 23rd 1945. The V2 is cutting capers before it landed on Scheveningen and killed six people of which four of one family. This diary fragment is kindly provided by Mr. R. van Vleuten, Egmond aan den Hoef. The wooded area around Ockenburg was well suited as a launching area for V2 rockets. The Monsterse Weg was a convenient approach road for the rockets and the tankers with liquid oxygen and alcohol. The road pattern of the Bloemendaal18 Foundation compound facilitated a much used launching site. From the air very little was visible because of the trees. As it was an out of bounds area (Sperrgebiet), only a few Dutch people frequented it, so it was highly secure. 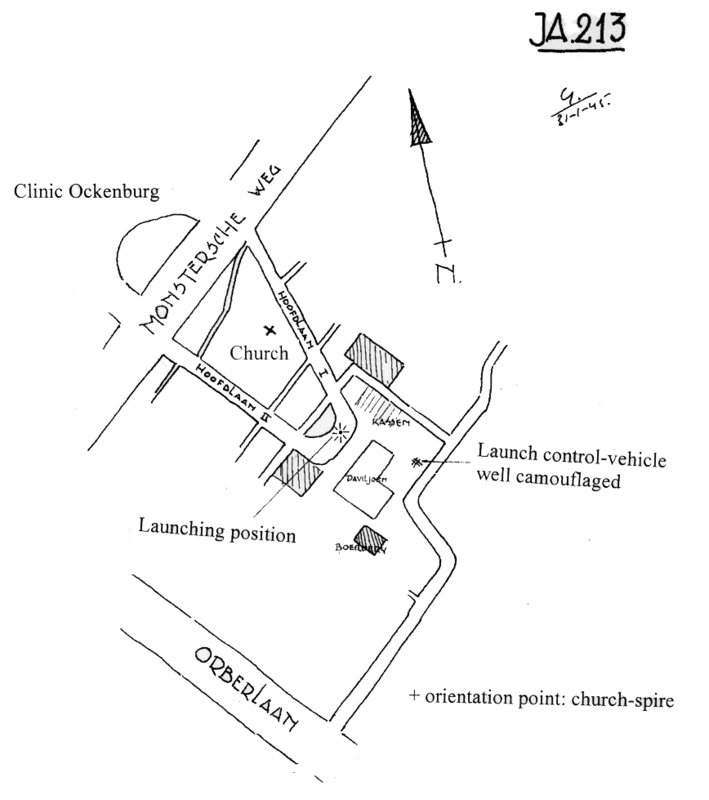 Nevertheless, the resistance managed to map the launching sites. The outbuildings of the Bloemendaal Foundation were heavily damaged by a V2 rocket crashing prematurely. The church was repaired later, but the scars of the impact are still visible. For many years the remains of a crashed V2 rocket could be seen in an enormous crater in a corner of the compound of the psychiatric institutions of Dorestad and Ockenrode, next to the Bloemdaal Foundation. On October 27th, 1944 at 3.53 hrs a V2 was launched from the driveway of the former Huis ter Nieuburg in the Wood of Rijswijk (Rijswijkse Bos). This spot is marked by an obelisk to commemorate the Treaty of Rijswijk in 169719. Soon after launching there was a defect, causing the rocket to crash from a height of around one kilometre. The Orphanage of the Crusaders of St. John (Kruisvaarders van St. Jan) was hit by the falling missile. Five brothers, seven boys and one staff personnel died and 24 people were wounded.